Stadia Solutions, the full-service sports agency, and Elonex, the digital-out-of-home media owner, have collaborated to help Blackburn Rovers Football Club increase their revenue stream, with the launch of a new external digital billboard at the club’s 31,000 capacity Ewood Park ground. The new digital billboard is dual-sided and features two 4.2m x 2.4m LED screens, which each utilise Elonex P8 High Dynamic Range Technology to broadcast engaging advertising content. Greg Coar, Commercial Director, Blackburn Rovers, commented: “The new screen at Ewood Park will help us expand our advertising and sponsorship opportunities. We are delighted to be developing our working relationship with Stadia Solutions and partners, and I’m excited by the opportunities the big screen can bring to our club and potential advertisers. We are looking forward to the new season with optimism about our on-pitch and off-pitch performance.”. 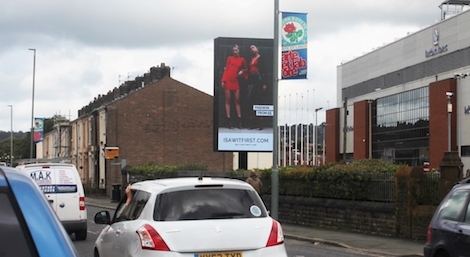 Strategically positioned outside Ewood Park to target high volume traffic travelling to and from Blackburn town centre on the busy A666, the new and permanent Digital Out of Home structure has been live since the start of the new 2017/18 football season carrying advertisements from many local and national brands. Installations like this, no doubt, provide clubs and advertisers with a new opportunity to generate revenue and to think of new and creative ways to market the club. This entry was posted on Wednesday, October 11th, 2017 at 14:54 @662 and is filed under DailyDOOH Update. You can follow any responses to this entry through the RSS 2.0 feed. You can leave a response, or trackback from your own site.